A new set has just break through and players are ready to break them in! New strategies are coming through and you know that many people are going to try to break the current standard format. Things are surely going to look dark for a moment but you bet that this only means that the game will just get better as new Pokemon are being release with BREAKthrough. Several new BREAK cards are going to be played with but which one will break away from the pack? This week on Featured Card we are going to look at a card that stands pretty tall and could make it into any deck. 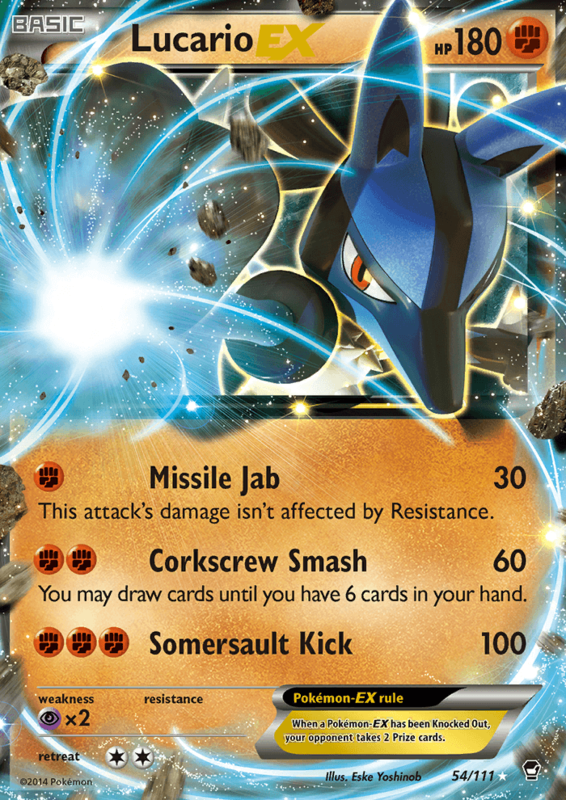 So get ready as we feature a new card from BREAKthrough and put the spotlight on Zoroark from BREAKthrough. Zoroark is a Stage 1 Darkness type Pokemon that has 100 HP. It was recently released in BREAKthrough and evolves from Zoura. Zoroark has an ability called Stand In which allows it to be switched with your Active Pokemon. Zoroark also has the Mind Jack attack which does 10 base damage plus 30 damage for each one of your opponent’s benched Pokemon. This attack cost two colorless energy. Zoroark has a weakness to the Fighting type but resist Psychic types by 20. Lastly, Zoroark has a two energy retreat cost. The best thing about Zoroark is that it has the ability Stand In. This is basically the same as Keldeo EX’s Rush In ability which gave any deck a free Switch when a Float Stone was attached to Keldeo EX. The same thing can be done with Zoroark thanks to Float Stone being reprinted in BREAKthrough. That means players have a way to get rid of pesky status conditions such as Poison or Sleep. It is never enjoyable to have unwanted status conditions or a high retreat cost Pokemon in the active and no Switch. So Zoroark with a Float Stone will be appreciated for those type of moments. 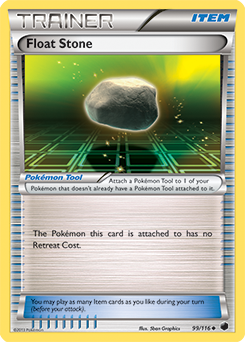 Because of this, some decks may try to splash in a one-one Zoroark line and Float Stone into their deck just to try to take advantage of ‘free retreat’. Zoroark also has a pretty great attack that is simple to pay if you have a Double Colorless Energy. If your opponent has a full bench and you have a Muscle Band attached to Zoroark then it will be hitting the magic 180 number to one-hit KO any EX Pokemon minus any Fairy EX Pokemon. That is not bad for a Stage One Pokemon. The good times for Zoroark doesn’t end there as it can BREAK Evolve into Zoroark BREAK. You may have to wait a turn to BREAK Evolve upon evolving into Zoroark but it is worth it. 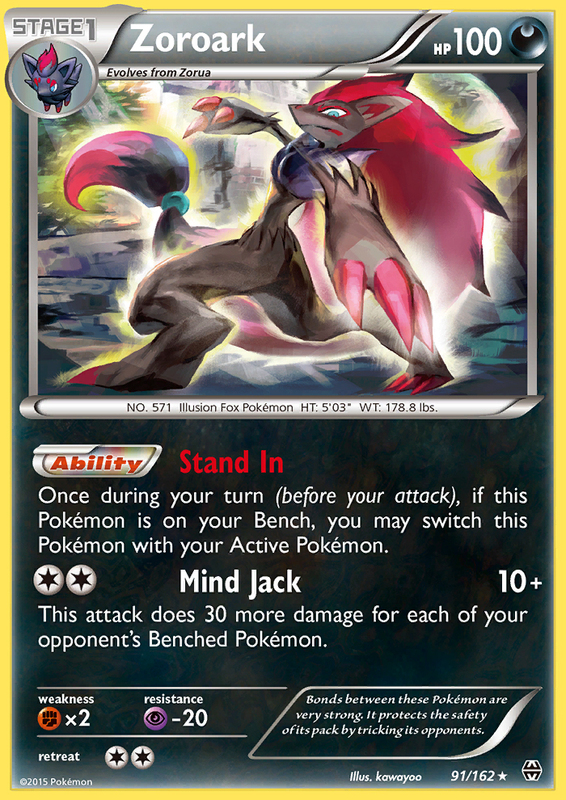 Not only do you get to still use Zoroark’s Stand In ability and Mind Jack attack but you get a new attack: Foul Play. This attack allows you copy any of your opponent’s active Pokemon attacks for a single Darkness energy. That means you can use Dialga EX’s Full Metal Impact without discarding any Metal energy. Hoopa EX’s Hyperspace Fury can be used to take knockouts on your opponent weaken or low HP opponent’s Bench Pokemon. Lugia EX’s Deep Hurricane attack can be used to inflict massive damage! All of this for a single Darkness energy. That is how powerful Foul Play can be with the right cards on the field. Things are not all good for Zoroark as it has a weakness to the Fighting type which are always rearing in to fight. Several Fighting decks can be seen in the game such as Medicham, Mienshao, variations of Lucario EX and Primal Groudon EX. All of these decks can easily hit for over 100 damage thanks to Muscle Band and Strong Energy. Just hitting for 100 is enough to knock out Zoroark. This leads to Zoroark’s second disadvantage which is his HP. 100 HP isn’t a lot of HP which means Zoroark won’t be fighting for too long. Especially if your opponent has an attack ready to hit hard waiting on the bench. Zoroark BREAK fixes this problem a little bit by giving Zoroark an additional 40 HP but it won’t be surviving any attack from a Fighting Pokemon. You may want to run a few Sacred Ash just to retreive a few fallen Zoura, Zoroark and Zoroark BREAK. Zoroark could be fitted into any deck as most players will try to play a one-one line just so they can get free retreat by attaching a Float Stone to it. Metal deck variants may try to play one as an attempt to replace Keldeo EX who was rotated in August. That way they can switch around their active easily after reloading a Pokemon with Metal energy by using Bronzong’s Metal Links ability. Though Zoroark will break though best in a Darkness deck. It is a strong attacker with or without BREAK Evolving. 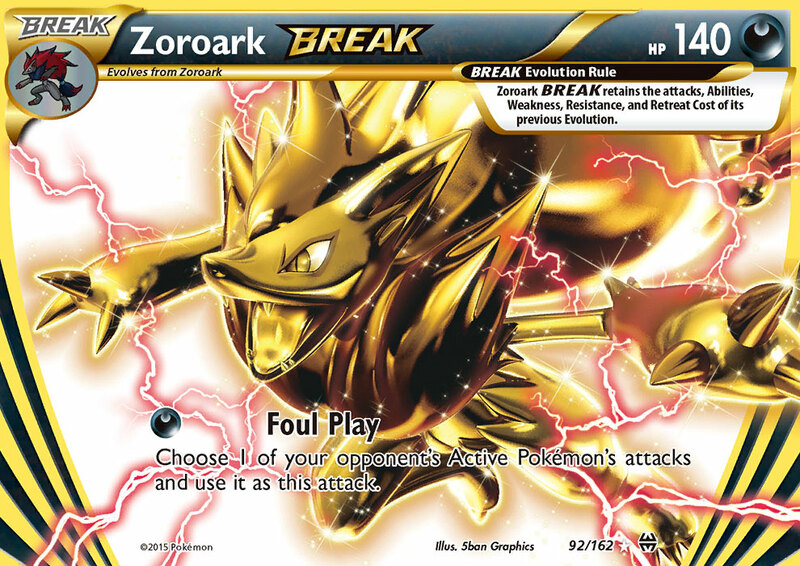 Though if you want to take full advantage of what Zoroark can do then you will want to run Zoroark BREAK. That way you can use Foul Play to steal some of your opponent’s Pokemon powerful moves! Darkness decks may have lost a few things with the last few rotations but it still is a strong type with a few options when it comes to their attacks. If you run your deck using a three-three-three Zoroark line including Zoroark BREAK with Yveltal EX and Yveltal as back ups then you have a pretty strong deck. You can use Zoroark and Zoroark BREAK to inflect heavy damage using Mind Jack and Foul Play. If you see a Fighting type Pokemon then switch over to Yveltal and Yveltal EX to attack. When things get more favorable for Zoroark then simply use Stand In to get Zoroark into the active and hit hard with an attack. Thanks to the various attackers, a useful ability to retreat in and out of the active and an attack that can steal various attacks gives you a rather flexible deck. All you need to do is just take a look at the situation and figure out which way of attacking will get you the win. A bit of advice when you are playing multiple Zoroark in a deck. You only need to attach a Float Stone to one Zoroark. That way you can take advantage of Stand In-Retreat (or free retreat) that Zoroark can provide. Multiple Zoroark with Float Stone is going to be pointless as you can only retreat once even though you can Stand In as many times as you benched Zoroark. Also, if somebody uses Startling Megaphone then all your Float Stone are gone. I would suggest that you put a Float Stone on one Zoroark and then attach Muscle Band to your other Zoroark. That way you can always have the option to hit 170 if you copy an attack that does 150 or more damage from an opponent’s Pokemon. Meanwhile, you can still be able to Stand In-Retreat if needed with another Zoroark with a Float Stone. Things are going to be breaking now that BREAKthrough has introduced several new cards. Though Zoroark may be able to stand above the rest! He is going to be in the game for quite a long time so make sure you give this card a try and see what you can do with it! 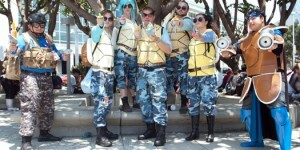 ← Pokemon Games! Announced in Latest Nintendo Direct!